Preheat oven to 400°F. On clean cutting board, use a sharp knife to butterfly your steak as evenly as possible across the grain. Try to get it to be an even thickness without too many holes in it, but don’t worry about it being perfect. 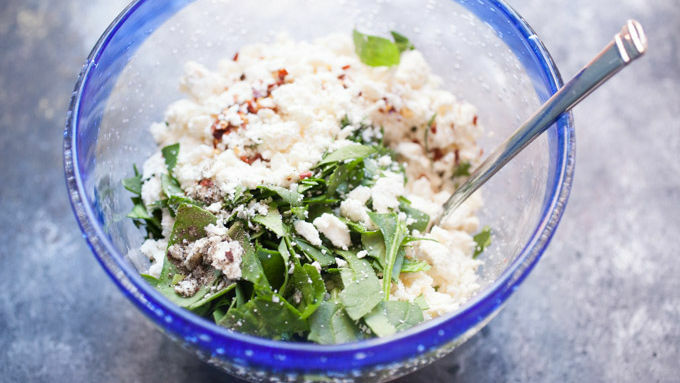 In a medium bowl, stir together chopped spinach, feta cheese, red pepper flakes and black pepper. Spread 1/3 cup of tomato sauce over the top of the flank steak and top with the spinach and feta mixture. 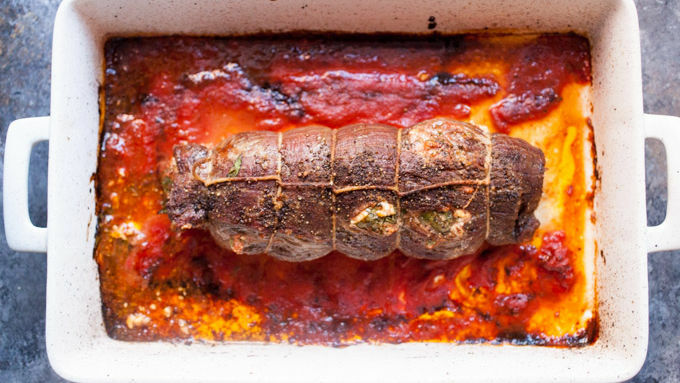 Roll flank steak up into a tight cylinder and secure with kitchen twine. 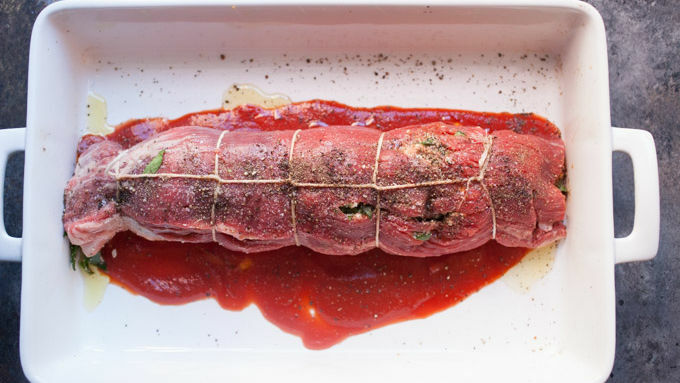 Drizzle the stuffed flank steak with olive oil and season with a big pinch of salt and pepper. Pour the rest of the can of tomato sauce over the top and around the edges of the flank steak. Bake at 400°F for 30-35 minutes, or until the internal temperature reaches 130°F at the thickest point. Turn oven to broil and cook 5 minutes more. 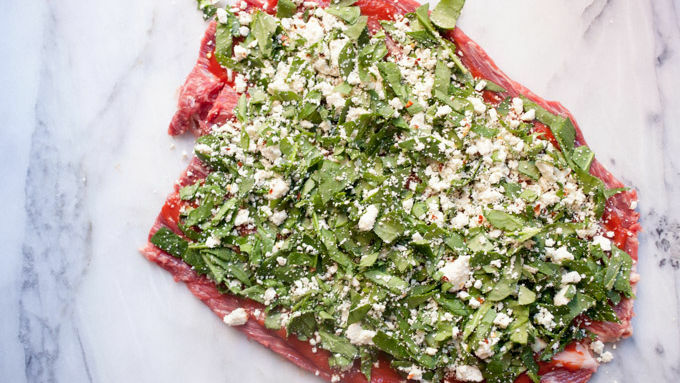 Remove from oven and transfer flank steak to a cutting board. Allow to rest for 10 minutes before removing the kitchen twine. Slice the steak roll-up into 1/4-inch rounds and spoon tomato sauce from the baking dish over the pieces before serving. Be sure to pay attention to the grain of the flank steak while you are butterflying, rolling and slicing it. The grain is the direction of the meat fibers that run across it. You want to butterfly it across the grain, roll it with the grain, and then slice it into coins across the grain. This will result in more tender pieces of steak. I love dishes that are multipliers of the work that went into them. Some dishes just look impressive even if they aren’t that much work! 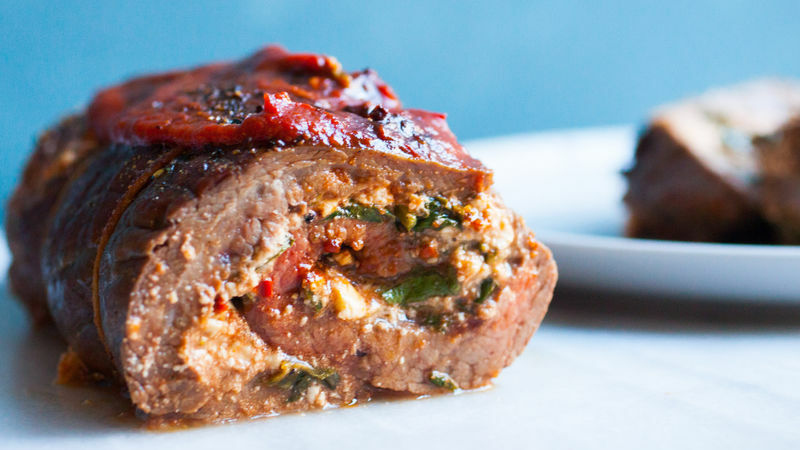 This stuffed flank steak is a perfect example. Place this finished dish on a table and people will be wowed. It’s a showstopper for sure. But, fortunately for you, it isn’t actually that hard to make (I won’t tell if you don’t). The filling is a simple mix of fresh spinach, feta and a few spices. Stuffing the flank steak might seem intimidating at first, but it’s actually easier than stuffing other proteins. I find it even easier than stuffing chicken breasts, for example. It’s more flexible and mistakes don’t show as easily. The trick to doing it right is to butterfly the flank steak as evenly as possible across the grain. So your result will be closer to a square shape, not a very long thin piece, if that makes sense. You’ll basically be folding the butterflied steak open like a book. Then spread some tomato sauce on your flank steak and pack on the filling. Roll the flank steak back up the way you butterflied it, then secure it with some kitchen twine and season with olive oil, salt and pepper. Then I like to pour over the rest of the can of tomato sauce. This cooks down into a delicious pan sauce you can serve with the steak. Roast the flank steak for about 30 minutes at 400°F. (Be sure to use a meat thermometer. It should reach 130°F when inserted in the thickest part of the flank steak). Then broil it on high for 5 minutes. Let the steak rest for 10 minutes and then slice, serve and accept all the oohs and ahhs.